In India, waste picking has long been a stigmatized profession. Waste pickers have said that they are treated "like the trash they collect". However, several places across the country are witnessing a change. In Pune, Kagad Kach Patra Kashtakari Panchayat (KKPKP) has helped waste pickers fight for their rights and work for the betterment of their community. It all began in 1993 with a convention of 800 waste pickers, which provided them a platform to air their grievances and concerns. The news about the convention spread among the network of waste pickers and the Kagad Kach Patra Kashtakari Panchayat was born. Through its work, the organization emphasized the fact that waste pickers contribute enormously to the city. Waste pickers also learned to see their work as respectable and environmentally beneficial. Alongside fighting for workers' rights, KKPKP launched a pilot project in 2005 for door-to-door waste collection work. 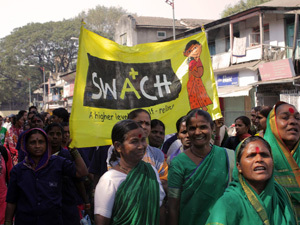 The success of this project led to the formation of SWaCH (a workers' cooperative run entirely by waste pickers and for them) and the integration of waste pickers into Pune municipality's waste collection system. SWaCH is today authorized by the Pune municipality to provide a variety of waste management services to households, including door-to-door waste collection. Its workers are involved in the collection, processing and recycling of waste. Trading in recyclables also helps them generate additional income and improve their quality of life. SWaCH's work reaches over 4,00,000 households in 15 municipal wards on a regular basis. Over the years, the membership of both SWaCH and KKPKP has swelled. The latter now has over 9,000 members, both men and women, all of whom have taken the oath to educate their children and discourage child labour. It also provides scholarships and educational loans to its members. Many children of waste pickers have finished school and are now studying in college. With its army of green warriors, KKPKP's fight for a better future for waste pickers and for a cleaner city for all continues. Visit http://tinyurl.com/KashtakariPanchayat to know more about the organization's history.